New to the Fairbanks Inn: High Speed Wireless Internet Service. Embrace leisure in one of our 45 charming, guest-enhanced guestrooms, spacious mini-suites, romantic honeymoon suites, and pet-friendly rooms, designed with classic Vermont charm and comfort bed and breakfast style for restful, romantic or relaxing retreats. 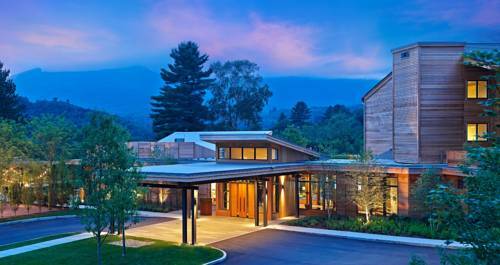 Vermont's only four star Preferred Resort and Spa. Located on a wooded 120-acre estate in the green mountains, overlooking Mt. Mansfield. Hotel features country manor style decor. Selected antiques, quiet guest areas with views of the mountains. Country resort blending contemporary mountain view rooms with balconies and cozy main inn facilities. Some rooms with fireplace and jacuzzi. Enjoy indoor pool center with heated pool, hot tub and sauna. Fitness center, entertainment room and pub. Central location one mile from the Village. Minutes to skiing and backdoor cross country skiing and snowshoeing on the recreation Path. Walk to restaurants and shopping. Romantic champagne packages available.